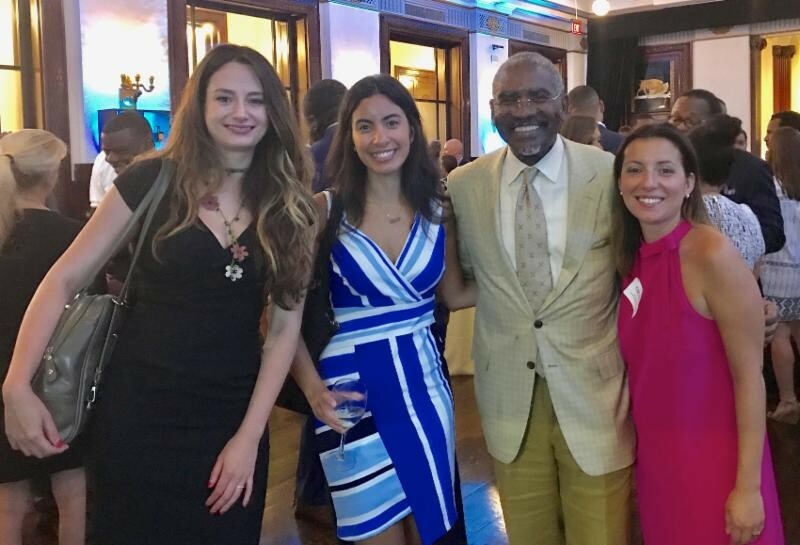 CBC PAC Chairman Rep. Gregory Meeks (D-NY/5th), Ranking Member of the Europe, Eurasia and Emerging Threats Subcommittee of the Foreign Affairs Committee, with members of the Turkish American women's delegation. 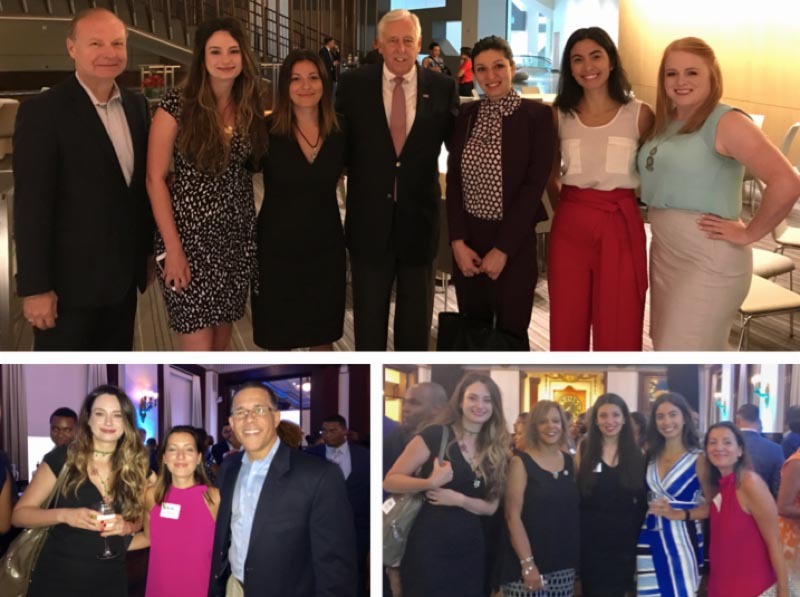 As part of TCA's Turkish American Women's Leadership Initiative, last weekend a delegation of five Turkish American women joined members of Congress and industry representatives at the Congressional Black Caucus PAC's (CBC) Annual Retreat in New York City from July 21-23, 2017. Nineteen Congressional Black Caucus members took part in the retreat as well as special guests House Minority Whip Steny Hoyer (D-MD/5th) and Reps. Jerrold Nadler (D-NY/10th), Filemon Vela (D-TX/34th), and Vicente Gonzalez (D-TX/15th). Representatives from 75 companies and organizations also took part in the retreat. The five Turkish American participants were Zelda Elcin of New York, NY; Emine Kasapoglu of Bloomingdale, NJ; Sezan McDaniel of Bethesda, MD; Ceylan Rowe of Northborough, MA; and Duygu Yigitsoy of New York, NY. Accompanying the delegation were TCA President G. Lincoln McCurdy and TCA Project Coordinator Liz Clark. At the retreat, the women’s delegation attended a reception with CBC members at the New York Stock Exchange; listened to policy panels and political discussions; attended a Broadway show; and took part in a brunch at the home of CBC PAC Chairman Rep. Gregory Meeks (D-NY/5th). News media representatives speaking on the policy panels included Joe Madison of Sirius XM Radio and Yamiche Alcindor of the New York Times. The delegation also had the opportunity to speak about the Turkish American community and the importance of getting involved politically with Minority Whip Hoyer, Rep. Nadler, and CBC members Reps. Anthony Brown (D-MD/4th), Lacy Clay (D-MO/1st), Val Demings (D-FL/10th), Alcee Hastings (D-FL/20th), Robin Kelly (D-IL/2nd), Gregory Meeks, and Terri Sewell (D-AL/7th). Top Photo: House Minority Whip Steny Hoyer (D-MD/5th) with the Turkish American women's delegation, TCA President G. Lincoln McCurdy, and TCA Project Coordinator Liz Clark. Bottom Right Photo: Rep. Robin Kelly (D-IL/2nd), member of the Foreign Affairs Committee, with the Turkish American women's delegation. Bottom Left Photo: Rep. Anthony Brown (D-MD/4th), member of the Armed Services Committee, with the Turkish American women's delegation.